Crystallization is a fundamental process of biomineralization , ice formation , pharmaceuticals design , and many other natural and industrial processes. Methods to control both the nucleation and crystal growth across multiple length-scales can have a great impact towards optimizing the engineering of a wide range of materials . For example, biomineralization, the process in which minerals are formed by living organisms under strict biological control, generates hard tissues (i.e. bones and teeth) that have complex hierarchical organizations from the nano to the macro scale that determine their remarkable performance . Towards the goal of engineering materials with similar properties and functionality, a great deal of research has been conducted to study the role of organic matrices on the mechanism of formation and higher-order organization of these tissues . Biomineralization occurs mainly within confined spaces in the presence of organic matrices . Therefore, understanding the effects of geometrical features on biomineralization may allow the control of crystal phase transformation, morphology, assembly, directionality, and overall structural hierarchy . Biomineralization involves two major processes including nucleation and crystal growth. During nucleation, the initial nucleation site must reach a critical size in order to enable mineral growth and proper mineralization. There are two mechanisms of nucleation: homogeneous and heterogeneous. In homogenous nucleation, mineralization occurs in a bulk solution, does not require a substrate or template, and exhibits a spherical nucleus in order to overcome the free energy barrier. On the other hand, heterogeneous nucleation originates from impurities in the system (i.e. surfaces and matrices) and requires less energy than homogeneous nucleation because the surface energy barrier is lowered by the interfacial energy following the Gibbs free energy equations . where ΔG is the free energy barrier of nucleation, r is the radius of the nucleus, ρ is the density of the new phase, Δμ is the difference in chemical potential between the new phase and the existing phase (also known as supersaturation), γ is the surface tension between the nucleus and bulk solution, and θ is the contact angle between the bulk solution and the substrate in the case of heterogeneous nucleation. If the total change in free energy in the system is negative, both nucleation and crystal growth occur due to favourable thermodynamic conditions . The contact angle (θ) is of great importance for determining the type of nucleation to take place. If the θ ≤ 90°, heterogeneous nucleation is favoured, while a θ between 90° and 180° results in lowering of the substrate wettability and increasing the probability for homogeneous nucleation. However, when the θ equals 180°, only homogeneous nucleation will occur. After nucleation, different types of crystal growth can be developed including faceted, dendritic, or spherulitic growth . Heterogeneous nucleation gives more control over the nucleation rate, and the crystal orientation, polymorphism, and morphology are greatly affected by the type of crystal growth mechanism. Therefore, optimizing crystal nucleation and growth by tuning the surface topography of substrates is an attractive strategy for the design and engineering of advanced materials . The field of materials science has benefited greatly from top-down fabrication techniques such as photolithography, soft lithography, reactive ion etching, and nanografting . The opportunity to use these kinds of methods in combination with bottom-up material synthesis approaches that require organization of molecular and nano-scale building-blocks is an exciting possibility to create well-organized hierarchical structures . Therefore, this strategy may be useful to control and study biomineralization. In this context, understanding the role of geometrical constraints on the precipitation of various mineralizing systems is of upmost importance . For example, it has been reported that nucleation could be preferentially triggered at acute-angled geometries compared to flat surfaces, given that the free energy barrier is decreased on those locations following the classical nucleation theory . Others have reported that the size of geometrical confinement can play a major role in stabilizing and increasing the lifetime of various amorphous and intermediate crystalline phases in both calcium carbonate , and calcium phosphate systems . These observations might be due to the slow transport of ions between phases . Similarly, minor variations in local environmental conditions (i.e. pH and temperature)  and the architecture of patterned scaffolds  have been shown to affect the diffusion of ions causing crystal growth into complex 3D morphologies. These studies suggest that precise and hierarchical geometrical features offer great potential to control heterogeneous nucleation and subsequent crystal growth processes towards the generation of hierarchically ordered mineralized materials. Biomineralized tissues including bone and dental enamel consist of a hydrophobic macromolecular framework made from proteins such as collagen and amelogenin, respectively. The ultimate function of this framework is to bring together hydrophilic acidic proteins such as bone sialoprotein (in bone) and enamelin (in enamel), which control and guide fundamental nucleation events . Strategically, ideal biomimetic platforms aiming to regenerate the complex architecture of such hard tissues, should include a similar molecular framework as part of the toolkit . Materials based on peptide amphiphiles, for example, are able to provide a nanofibrous matrix including phosphorylated serine domains to induce nucleation, and subsequent hard tissue regeneration . Other molecular matrixes based on collagen , silk , and chitosan  have been used to provide structural support as well as nucleation-promoting epitopes found in bone sialoprotein , dentine matrix proteins , and glycosaminoglycans , respectively. Elastin-like polypeptides (ELPs), recombinant proteins based on tropoelastin have received great attention as tunable molecular building blocks of biomaterials. On the other hand, statherin, a salivary protein that acts naturally as a chelating agent for calcium ions in saliva, and subsequently enhances enamel remineralization during acid attacks . Therefore, ELPs displaying mineralizing segments such as these found in the statherin protein, have been designed to enhance bone regeneration . ELP-based materials comprising bioactive segments such as this statherin-derived sequence have been fabricated into specific, controlled topographical patterns . Therefore, these materials offer a useful platform to investigate the synergistic role of surface chemistry and topography on mineralization of calcium phosphates. 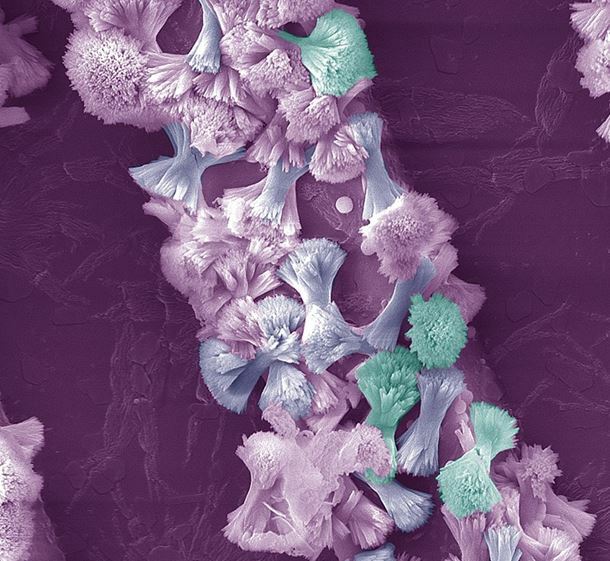 The cover image shows the preferential nucleation and growth of fluorapatite crystals on a channel-containing a microfabricated ELP-based membrane. The membrane was fabricated as previously reported . The apatite crystals grew and arranged preferentially along the ridges of the channels and were absent in the channel grooves. Moreover, more crystals were observed to be present in areas where the horizontal and vertical sections of the channels would meet creating a 270° angle compared to flat surfaces, which could be due to reduction of the energy barrier as previously explained. To sum up, recent advanced fabrication methods would allow further exploration of the effect of surface topography on crystallization, thus in turn permit tuning and optimizing many crystalline systems for a wide range of biomedical and industrial applications. The work was supported by the ERC Starting Grant (STROFUNSCAFF), and the FP7-PEOPLE-2013-CIG Biomorph.